Very rare and wonderful, 1860's Sixth Plate Tintype Photograph of a Civil War Union Artilleryman purported to be a member of the 2nd Regiment, Massachusetts Heavy Artillery in full uniform and holding his kepi which displays the insignia of his Regiment and Company. This beautiful, Tintype Photo measures approx. 2 1/2" by 3 1/4" (Sixth Plate size) and is housed in what appears to be its original pressed leather hard case. This outstanding, 1860's Tintype Photo features a 3/4 length, seated portrait of a Union Soldier wearing an enlisted man's nine button frock coat and displaying his kepi on his lap. The top of the kepi features the crossed cannon insignia identifying him as an Artilleryman with the number "2" above and the letter "I" below. Obviously he is a member of Company (or Battery) I of a 2nd Artillery Regiment - a small paper identification that came with the Image states that he is a member of the 2nd Mass heavy Artillery but we are unsure how the person who wrote this came to that conclusion. This wonderful, 1860's Civil War Union Artilleryman Tintype Photo is in very good condition. The Image is crisp and bold with sharp focus, strong contrast and warm, rich tonality. There is no staining or discoloration - no significant scratches, no flaking, no significant surface crazing and no bends or creases. The Photograph is very well preserved and displays beautifully. The pressed leather hard case is split at the spine but otherwise exhibits very light wear only. A very rare and very attractive, 1860's Sixth Plate, Tintype Photograph of a Civil War Union Artilleryman and a fantastic addition to any collection!! And Click Here to Add Us To Your Favorite Sellers List. Click Here to Discover More About this Item and Many Others on Our New Informational / Non-Commercial / Reference Blog - Walnutts. 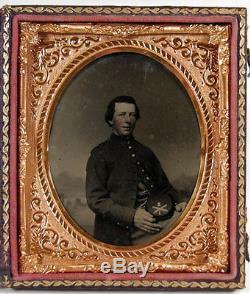 The item "1860's CIVIL WAR 1/6 PLATE TINTYPE PHOTO OF ARTILLERY SOLDIER 2nd MASS COMPANY I" is in sale since Friday, June 05, 2015.